The hubby and I are foodies and we're always out on a hunt for the best food in Singapore. For our 5th anniversary (which was also 1 day before the hubby's 35th birthday), we had an agreement that i would buy him a nice (read: expensive) dinner. I know he loves a good steak anytime, and since we were going for a staycation at MBS, i thought Cut by Wolfgang Puck would be a good place to go. I did some research online (scoured through forums and asked friends on Facbook) and everyone said Cut was a good choice. Unfortunately (or fortunately, for my bank account), we had late lunch that day at Carnivore and couldn't bear to eat another piece of meat for the rest of the days, so our plan to go to Cut for dinner was shelved. Then, i remembered a friend suggesting Hide Yamamato and since both of us love Japanese food and preferred something lighter, why not try this place? Quite impressive lah, except that i had already been to Las Vegas when i was young, so this was really 小儿科 (child's play)! Anyway, moving on to the restaurant. First look - it was rather small and dingy, not a place i would associate with fine dining. A secondary-school-kid lookalike asked us whether he could help us and after ding-donging back and forth, he finally got a more senior staff to attend to us. First impression of the place wasn't fantastic, but we made our reservation for 830pm that night in the end, and left the place feeling a little apprehensive. We came back to the restaurant again at 830pm sharp and were ushered to a table right at the corner of the Ramen & Dining area. 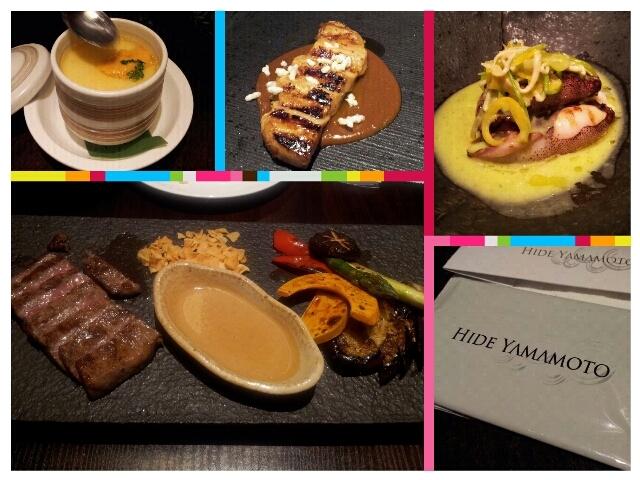 The restaurant is actually divided into 5 areas with five different concept - Sushi, Teppanyaki, Robata, Ramen & Dining, Sake Bar. I didn't know what "Robata" was but from the menu, it was supposed to be "Petrified wood charcoal grill, emphasizing fine meat, poultry and vegetables in the purist form". Okaaaaaay. We had great fun looking through the menu and deciding what we wanted to eat. Just so you know, the hubby is very particular about "wasting space" (according to him, my salad was a waste of space when we went to Carnivore earlier in the day), and since we were still not terribly hungry, we decided to forgo the ramen and try abit of everything instead. First up, sushi! The hubby ordered the Premium 5 Kinds of Sushi. Honestly, i really love this even though it looks pretty normal. The rice came in the right amount and the sashimi was perfect. 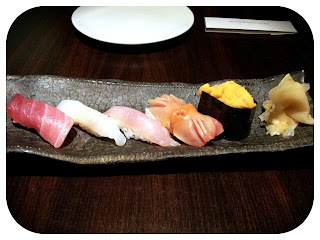 I loved that it was served at room temperature because then, you can taste the sashimi at its finest. Next, my "Chawan Mushi" with Black Truffle Flan and Sea Urchin. First mouthful and i had the classic "幸福的感觉"! You can tell i love my eggs! The steamed egg had "substance"and packed a heavier, more custardy texture (i don't think "custard" is an appropriate word since chanwan mushi IS custard anyway) rather than the kind i'm used to, the kind that just disintegrates in your mouth the moment you eat it. 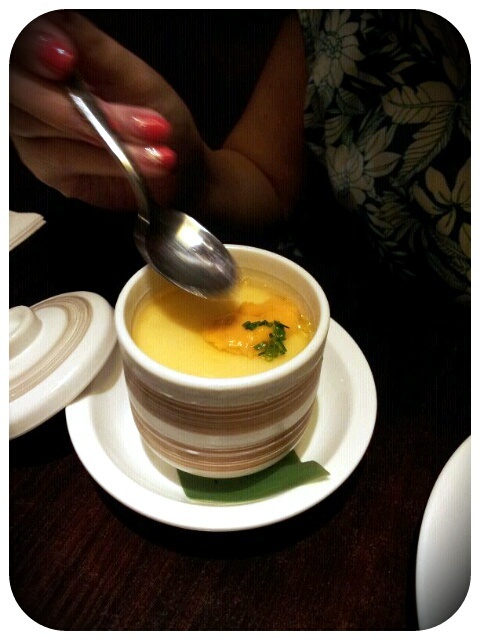 The broth which sits on top of the chawanmushi was really yummy - tasty but light. This is the first time i'm eating sea urchin though (first was 5 minutes ago when i ate the sushi!) but being a seafoodie who indulges in hum and all, i love how it just melts in your mouth! The bits of black truffle were at the bottom of the bowl - i didn't think this was the most perfect thing to go along with the lovely chawanmushi but that's okay, the rest of this more than made up for it. 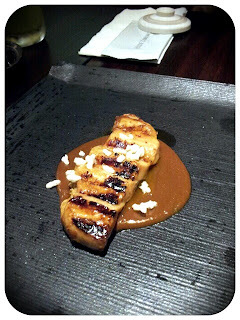 Then, the hubby had his Saikyo Miso Foie Gras with Crispy Rice. This was cooked the Robata way. For obvious reasons, i'm not a fan of Foie Gras but the hubby said it was delectable! As he was eating this, i went on and on about how geese or ducks were forced fed and it made him disgusted for a few minutes i think. He managed to get me to eat a small slice but i shuddered as i swallowed it. Cruelty aside, it was too jelat for me! Pass! 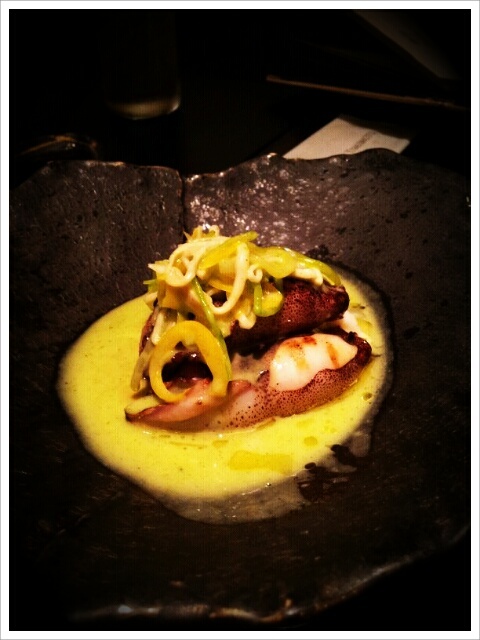 Another Robata dish - Grilled Squid Stuffed with Cod Mousse in Light Clam Butter Sauce. Oh, and i forgot to mention the sauce was oh-so-yummy too! Although it's a "butter" sauce, it didn't have a heavy texture and was so so so flavourful. 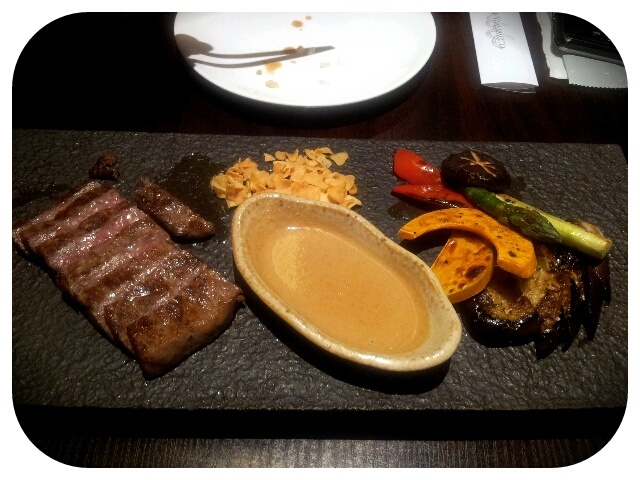 Last but not least, we had the Teppanyaki Japanese Wagyu Sirloin Beef! This gave me the "幸福的感觉" again! What else do i need to say - it's wagyu beef. The yellowish bits in the middle (that look like almond slices) are actually deep fried garlic chips. Innovative, and it goes well with the beef. As we all know, wagyu beef is the premium cut of beef and is so good because of the marbling in the meat. The ah beng at the next table obviously didn't think so because he called the manager to his table and started complaining crassly that the beef was too fatty (?!?!). I mean, like seriously, isn't the fat flecks in the meat the best part? Anyway, to sum it all up, it was a fabulous dining experience. The food was scrumptious, the company was excellent as always, nevermind the lack of ambience even though it would be really nice to have a lomantic anniversary dinner. Oh, best part was the hubby decided to pick up the tab (i knew he would never let me pay!) and for the quality of food, the damage done was considered reasonable. I would definitely go back again and the next time round, i want to try their Ramen!